Need an energy boost to get you through the day? Skip the double espresso and the fist full of M&Ms and try these expert-backed tips instead. American work culture is guilty of driving us to work longer and harder, leaving our energy levels at a lull. In fact, according to a 2015 survey from YouGov, 54 percent of Americans sleep only 6 hours per night and still wake up tired on 4 or more days per week, and 27 percent of Americans manage to get a full 7 to 8 hours a night and still report feeling tired or fatigued four or more days a week. Why are we so fatigued, even if we’re getting sleep? 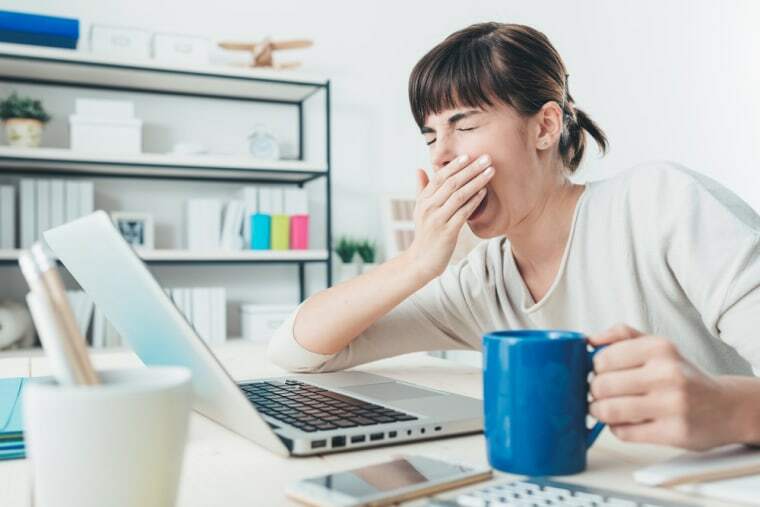 It’s likely because fatigue and sleepiness aren’t the same thing, says Dr. Matthew Ebben, Ph.D., associate professor of Psychology and Clinical Neurology and sleep expert at Weill Cornell Medicine and New York-Presbyterian, in New York City. Ebben explains that a temporary lull in energy levels, or a little sleepiness around mid-late afternoon, isn’t really due to fatigue but a dip in your circadian rhythms, or internal body clock, which play a key role in regulating your sleep/wake cycles. “Your underlying sleep drive changes throughout the day,” Ebben explains. “Most people have a little dip in circadian rhythms mid-afternoon, depending on when they sleep and wake up, usually between 1-4 pm. When you have this dip, you can feel sleepy for a half an hour to an hour.” This mid-afternoon lull is usually when we tend to reach for a cup of coffee, or something sweet, to give our energy levels a boost to get through the rest of the work day. Is it just the midday slump or something more? Ebben says the first step to figure out if sleep or fatigue is causing your lack of energy is, quite simply, to get more sleep and see. If you sleep a lot longer past your weekday alarm on weekends, your body might be trying to make up for lost time. “Let’s say your alarm wakes you up every day at 6 am, but you’re sleepy during the day. On the weekends, without an alarm, you sleep until 9. What that tells you is you’re chronically sleep deprived during the week,” he explains. Fatigue, however, is another story — and the common culprit likely won’t surprise you. “Stress is a common cause of fatigue in that it results in the release of inflammatory molecules that enter the brain and cause the feeling of fatigue,” says Peg Baim, M.S., N.P., director of clinical training at Benson-Henry Institute for Mind Body Medicine at Massachusetts General Hospital. Regardless of root cause, how can we best pull through these energy lulls without reaching for coffee and sugary treats? We enlisted the help of a few experts to share energy hacks we busy people can employ when we’re at a low ebb. Studies show that exercise improves cognition and releases endorphins — also known as feel-good hormones—that boost your mood and energy levels, especially after high-intensity workouts. So, if you’re dragging yourself out of bed and need to wake up quick, a few burpees (5-10) will maximize blood flow to your brain and body and help you get alert, says Bo Babenko, DPT, a physical therapist at Halevy Life. Though it’s tempting to subsist on coffee until lunchtime, studies show that eating breakfast can slightly boost your brain power. And, as we’ve reported before, having a protein-packed meal first thing can help silence signals in your brain that can lead to sugar cravings later on, trigger signals in your brain that make you feel full. To keep your energy flowing throughout the day, be sure to take movement breaks. “When it comes to fighting fatigue, exercise is key,” says Baim. “Aim for 30 minutes 5 days a week, at least 4 hours before sleep,” she recommends. If you start to feel droopy at your desk, Babenko says these chair press-ups (make sure the chair is sturdy) are his go-to recommendation for office workers who need a quick pick-me-up. Or, if you’re sagging through through a marathon meeting or long client dinner, he recommends sneaking into the restroom to do 10 squats for a quick pick-me-up. That 4 o’clock sugar craving may feel like it’s giving you a boost, but the blood sugar crash you’ll feel a few hours afterward will leave you ready for bed right after dinner. To keep your energy levels (and mood) even, snack on a combo of protein and carbs — like yogurt with fruit and nuts or a protein shake with fruits blended in — says Deena Adimoolam, assistant professor of Medicine, Endocrinology, Diabetes and Bone Disease at Icahn School of Medicine at Mount Sinai. As Baim mentioned above, stress is a common cause of fatigue. So how can we best de-stress when we don’t have 90 minutes for a yoga class? “Positive thoughts buffer stress, so keep your brain out of trouble 2-3 hours pre-sleep,” she recommends. “All negative thoughts turn on the brain’s stress response and will make it harder to get high quality sleep, or to fall and stay asleep. Instead of worrying, focus on positive thoughts, such as positive expectations and appreciations.” She also recommends meditation as a way to counter stress and lead the brain into the same EEG pattern as the first stage of sleep, so you can ease yourself into bed time and catch the z’s you so desperately need. These apps and expert Zen hacks can help you get started. To get more sleep during the week, Ebben recommends slowly dialing back your bed time by 15 minutes, every five days or so. If you find yourself staring at the ceiling instead of passing out, you might be in bed too early. Once you find your sweet spot, stick to it consistently to maintain your sleep quality — sleeping in on weekends can cause you to stay up past your bedtime, making it that much harder to adjust come Monday morning — and to do those burpees.